This last weekend it was Tyson's family reunion in Salt Lake, So we decided to plan an eventful weekend for Parks while we were up there anyhow. On Friday night we stayed at my brother Adam's house. It was nice to spend time with him and see his kids. We don't get the opportunity to see him very often. 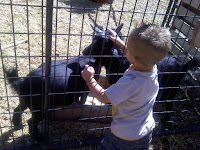 Saturday morning we took Parks to The Historic Wheeler Farm. We went there with my good friend Nykel, her husband, kids and sister. My Mom and Brother also came along with my brothers wife and kids. Parks LOVED the animals there. 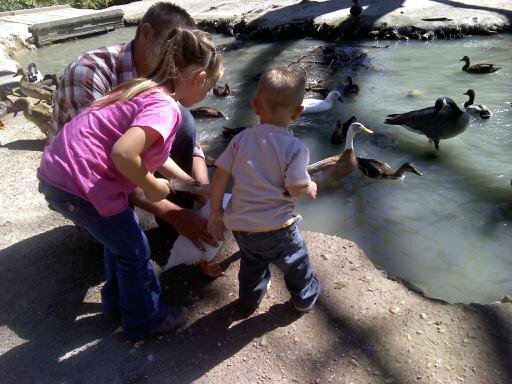 He fed the ducks and pet the goats. It's free to get into the farm [which I was stoked about] and It was a really pretty morning to spend with friends and family. After the Farm experience we went to the Park for Tyson's family reunion, and here's a few photos of Parks playing on the the playground. On Sunday we decided to take Parks to the Hogle Zoo. I hadn't been to a Zoo in YEARS and Parks is obsessed with animals lately, so I knew he would be in heaven. He was so excited to see the Elephants and the monkey's and kept repeating the word "monkey" all day long. It was really fun as parents to introduce him to animals and get to see his reaction when seeing some of them for the first time. My grandparents live in the neighborhood right across the street from Wheeler Farm. We went all the time when I was little and now my kids love it. Congrats on your second! It's a lot of fun having two! Looks like you had a fun time. We need to get together to do something.